Rachel is a Fine Art graduate & designer-maker with over 25 years’ experience working in craft and design. 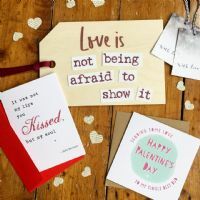 She has been making cards and pretty paper things since she was knee-high to a daisy, and with ever-growing requests for cards and wedding stationery from family and friends, Rachel launched Arbee Cards in June 2010. Arbee cards are vintage-inspired with some designs featuring unique Northern Irish language!